Details iPlay America Easter event, the Sonny the Bunny’s Colossal Carrot Adventure and their VIB Easter Bunny breakfast, two fun Monmouth County Easter Events in Freehold, New Jersey. iPlay America in Freehold offers concerts & events for kids and teens yearround. We’re sharing information about iPlay America upcoming events and concerts. iPlay America is a great way to have indoor family fun in New Jersey. We’re giving away 4 iRide Plus Passes so your family can have a day of indoor fun. 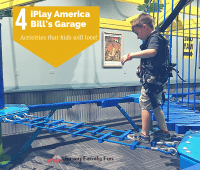 4 iPlay America Bill’s Garage Activities Kids will love! 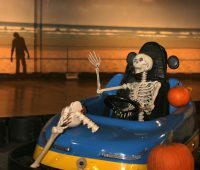 iPlay America Bill’s Garage just opened at this indoor theme park in Freehold New Jersey. We’re sharing the new activities we know kids will love. 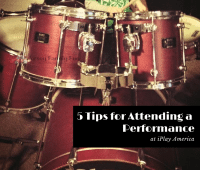 With so many great concerts at iPlay America for kids and teens we wanted to share these tips for attending an iPlay America performance. 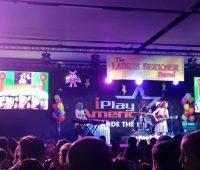 Details and pictures from the Laurie Berkner Band at iPlay America concert in Freehold, New Jersey, part of our concerts for kids in New Jersey series. Details about IPlay America’s Summer Season Pass. iPlay America is an indoor New Jersey attraction in Freehold providing great family fun in New Jersey.